Lapsi which is high in fibre,vitamin and complex carbohydrates and is also a great dish for diabetic people. For a change I tried these Puli pongal in lapsi. The dish is very simple and easy to make and requires ingredients that are easily available within the home only. 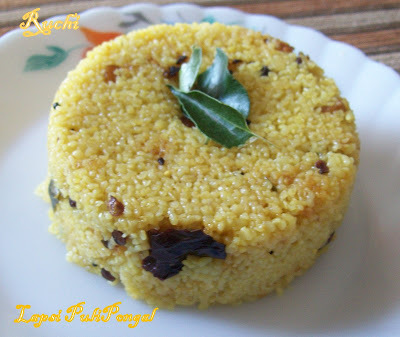 This tangy version of pongal is prepared either for breakfast, lunch or dinner. . It is bit unusual from the regular pongal. It comes out very well and everyone likes different tangy &spicy taste. 1.Soak tamarind in two cups of water and keep aside. 2.In a pressure pan, add gingelly oil when it is hot add mustard seeds when it crackles add urud dal, channa dal,peanuts,curry leaves and asafetida. 4. When it is boiling slowly add the Broken Wheat Rava Add salt keep stirring without any lumps. 5.Cover it and cook for 10 min.Add curry leaves and serve. Wat a super tempting and healthy dish, looks irresistible. லாப்சி கோதுமை ரவா புளிப்பொங்கல் செய்து பாத்தாச்சு. நல்லா இருக்கு.